The Bodleian Libraries hold a rich and varied collection of papers related to the Edgeworth family from the 17th to the 19th century. Only a tiny percentage of the material contained therein is available in print and even less has been subject to scholarly editing. 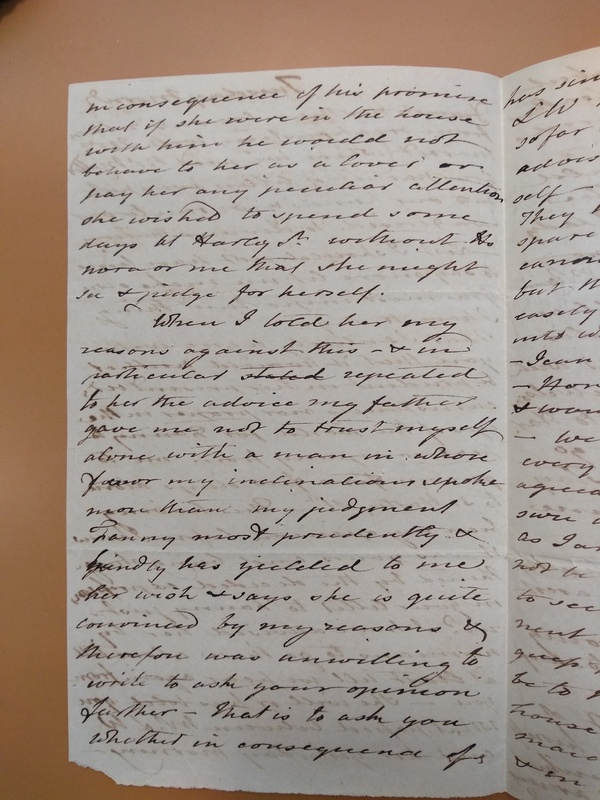 The collection may be little known, but it is of great significance, providing vital evidence (manuscript drafts and correspondence) about the literary career of one of the most important novelists of the early 19th century, Maria Edgeworth (1768-1849). Maria’s work is also placed in context by additional documentation that covers the educational, agricultural and political theory and practice of her father, the politician, writer and inventor Richard Lovell Edgeworth (1744-1817). 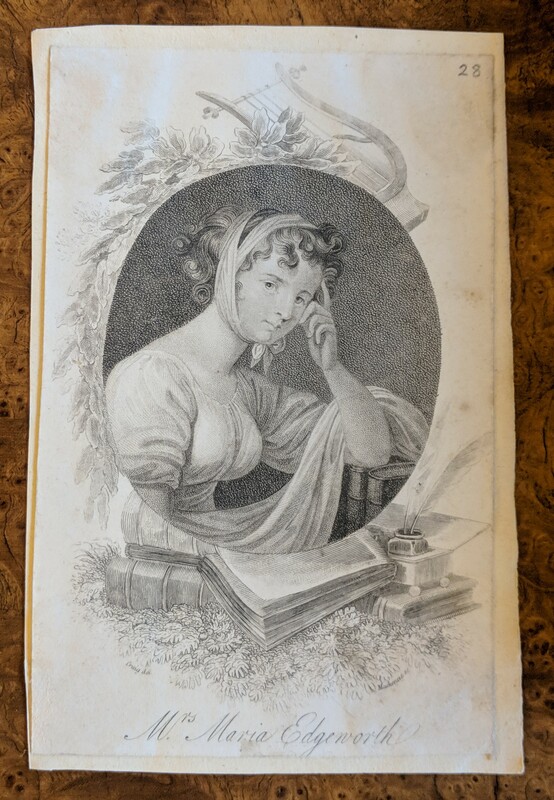 Engraving of Maria Edgeworth (MS. Eng. misc. c. 901, fol. 28). Through assorted written material, the collection shows the ways in which an extended family with connections in Ireland, England, France and India, communicated and collaborated in the production of art, literature, and scientific knowledge. And it sheds light on Anglo-Irish relations during a period of political contestation and transformation. 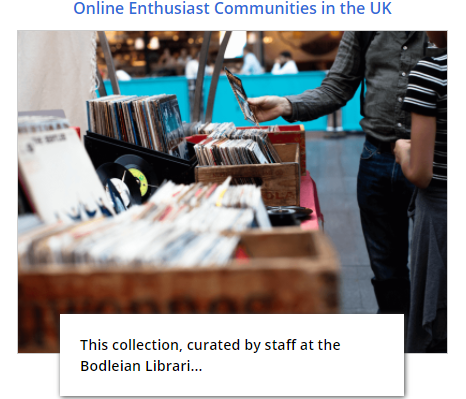 Over the next 12 months we will investigate ways of raising the profile of this collection through social media, scholarly and digital editing. 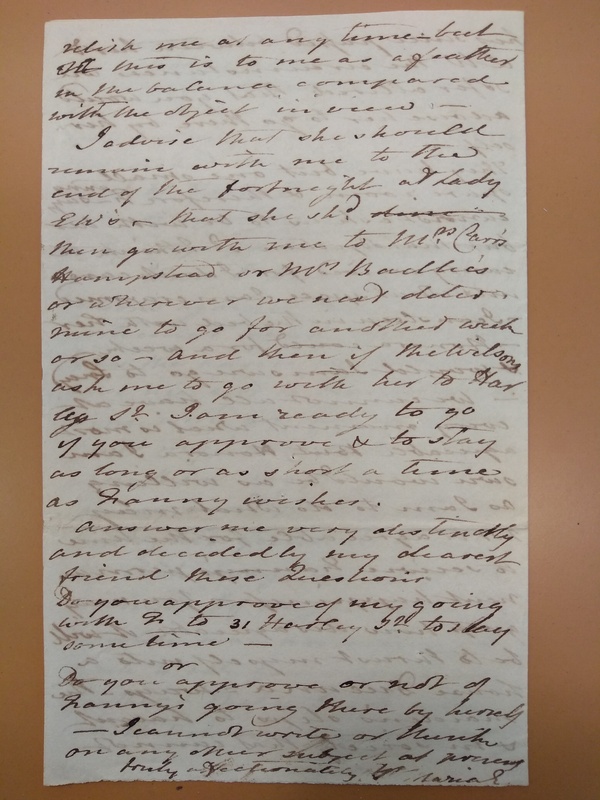 The project takes one selection of the material in the Edgeworth papers— correspondence and other evidence related to the year 1819-1820— and tracks it alongside 2019-2020, a momentous period in the history of the relations between Britain and Europe. Each month, our blog will present sample documents from the same month 200 years earlier. Writing in March 2019, as the UK faces huge political upheaval, let us introduce you to Maria and her family, who in March 1819 are in the midst of a personal – rather than political – challenge on both sides of the Irish Sea. As the old song says, love and marriage go together like a horse and carriage. But in the early 19th century, ‘love’ wasn’t the key concern. The idea of the ‘marriage market’ brings home the financial considerations of matrimony in the period. For women, this was particularly acute. The financial and legal implications of an imprudent marriage were serious – it was, after all, impossible to get a divorce without first obtaining a private Act of Parliament. It is no wonder families were so invested in securing the right matches for their children – and no surprise that so many novels dramatised the intrigues, concerns and implications of the marriage market in the ‘courtship plot’. Lady Russell in Jane Austen’s Persuasion (1818), for example, convinces heroine Anne Elliot not to marry the nobody Frederick Wentworth as this would present too much of a social risk. When Wentworth returns a Captain, Lady Russell’s opposition comes across as snobbish and intrusive. In the context of 19th-century marriage laws and women’s rights, Lady Russell’s concern is sincere. Today marriage comes under the umbrella of ‘personal relationships’, but 200 years ago matrimony was very much a family affair. In March 1819, bestselling novelist Maria Edgeworth was embroiled in her own family affair that could have come straight from a novel like Persuasion. Her young half-sister, Fanny, some 30 years Maria’s junior, was being courted by a man whose morals her family admired but whose personality they considered rather dull: the ‘Mr. L.W.’ [Lestock Wilson] of 31 Harley Street. Fanny, Maria and another half-sister, Honora (1791-1858) who was only eight years older than Fanny, were visiting London together. 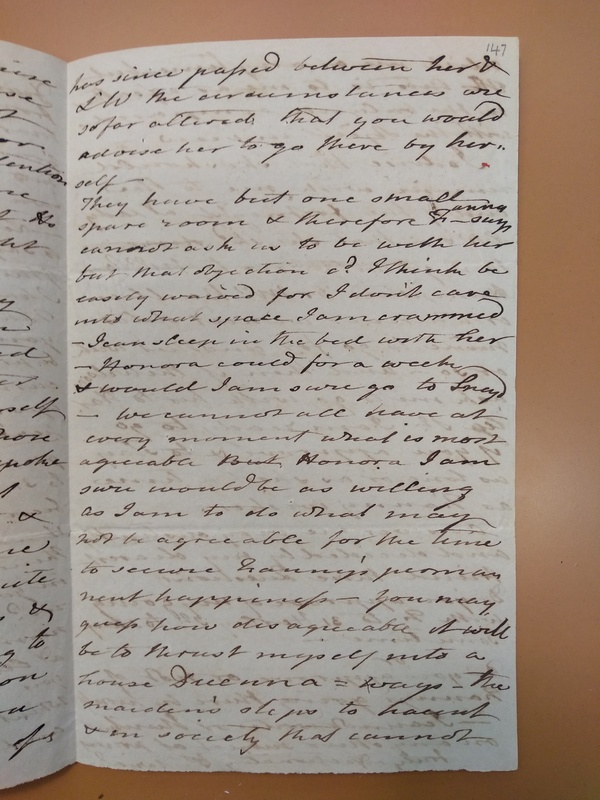 Maria hurriedly wrote home to Edgworthstown, Ireland, to her step-mother– and Fanny’s mother – Frances Ann Beaufort (1769–1865), her ‘dearest mother’ (in fact one year younger than Maria herself) – to discuss what to do. Believing Mr LW to be unsuitable, Maria sought to dazzle Fanny by opening the country-educated girl to the best of London society. She had herself refused a proposal of marriage in 1802 from the Swedish intellectual, Abraham Niclas Clewberg-Edelcrantz (1754-1821), who she met on a family visit to Paris, lacking the confidence to leave the family she loved so dearly for an uncertain union. 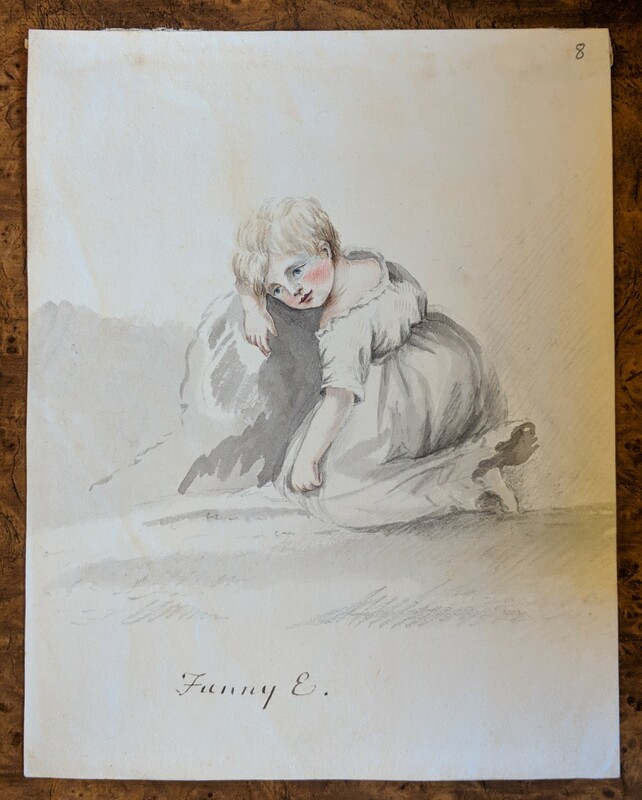 Drawing of Fanny Edgeworth as a young child by her mother Frances Edgeworth (MS. Eng. misc. c. 901, fol. 8). 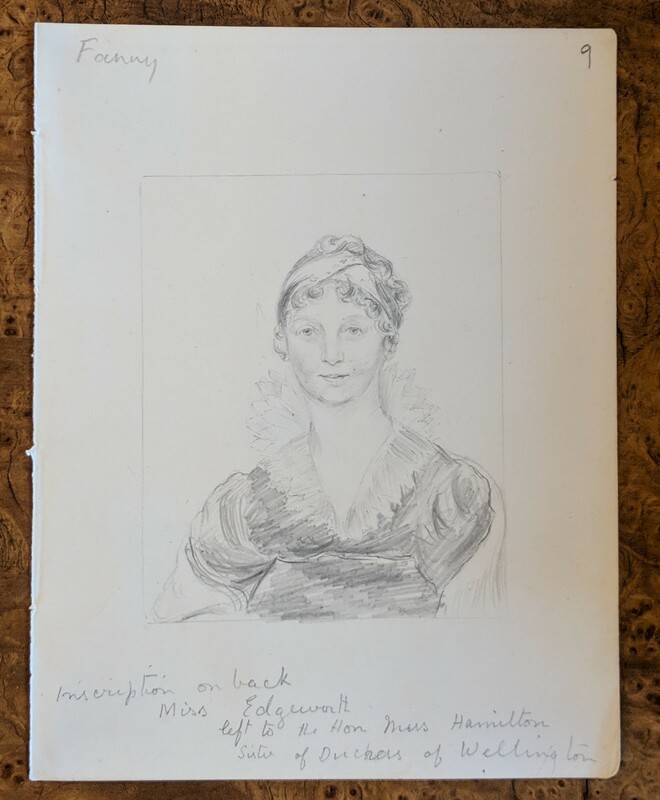 Drawing of Fanny Edgeworth as a young adult by her mother Frances Edgeworth (MS. Eng. misc. c. 901, fol. 9). The urgent tone of this letter bespeaks the need to act quickly and decisively. Both Maria and Frances are wary of Fanny accepting the invitation to Mr LW’s house, though she was desirous to ‘see & judge for herself’. Despite LW’s protestations that ‘he would not behave to her as a lover or pay her any peculiar attention’, such a visit would be ill-advised: as Maria contends, it would be neither ‘prudent’ nor ‘proper’. 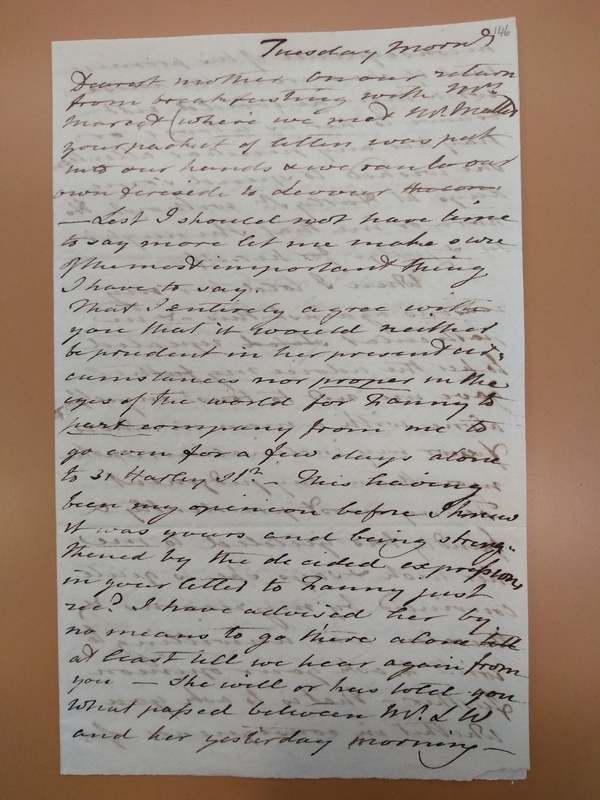 Letter from Maria Edgeworth to Frances Edgeworth (MS. Eng. lett. d. 696, fol. 146r). Letter from Maria Edgeworth to Frances Edgeworth (MS. Eng. lett. d. 696, fol. 146v). Letter from Maria Edgeworth to Frances Edgeworth (MS. Eng. lett. d. 696, fol. 147r). Letter from Maria Edgeworth to Frances Edgeworth (MS. Eng. lett. d. 696, fol. 147v). Maria’s concern is that a strong romantic inclination may not be sufficient to ‘secure Fanny’s permanent happiness’. Admittedly, Maria does not relish her ‘Duenna’ (chaperone) role, but writes that ‘this is to me as a feather in the balance compared with the object in view’. Convinced of Mr LW’s unsuitability, the Edgeworths sought to protect Fanny from a marriage that she wouldn’t be able to leave. The following month, Fanny refused him – but she regretted and mourned her decision, accepting his renewed proposal some ten years later. This letter also gives us an insight into the complex generational dynamics of the Edgeworth family. Maria’s father, Richard Lovell Edgeworth, married four times and had 22 children. Richard’s death two years before these events left Maria and his fourth wife, Frances, to direct the family drama. Maria takes on her father’s mantle (she’d had early experience in helping him manage his family estate) and adopts a paternal role in agreeing with Fanny’s mother the best way forward. Dearest mother On our return from breakfasting with M.rs Marcet (where we met M.r Mallet) our packet of letters was put into our hands & we ran to our own fireside to devour the con – Lest I should not have time to say more let me make sure of the most important thing I have to say. That I entirely agree with you that it would neither be prudent in her present cir=cumstances nor proper in the eyes of the world for Fanny to part company from me to go even for a few days alone to 31 Harley St.t – This having been my opinion before I knew it was yours and being streng=thened by the decided expressions In your letter to Fanny just rec.d I have advised her by no means to go there alone till at least till we hear again from you – She will or has told you what passed between M.r L W and her yesterday morning – in consequence of his promise that if she were in the house with him he would not behave to her as a lover or pay her any peculiar attention she wished to spend some days at Harley S.t without Honora or me that she might see & judge for herself. I advise that she should remain with me to the end of the fortnight at Lady E W’s – that she sh.d dine then go with me to M.rs Carr’s Hampstead or M.rs Baillie’s or wherever we next deter=mine to go for another week or so – and then if the Wilsons ask me to go with her to Harley S.t I am ready to go if you approve & to stay as long or as short a time as Fanny wishes. The blended Edgeworth clan – consisting of several step-mothers, numerous half-siblings – provided a whole series of domestic dramas, revealing surprising alliances, deep loyalties and often lively comedy. Over the next 12 months we look forward to opening the Edgeworth papers, uncovering their stories, and sharing them with you. Having been awarded the Diversity Bursary for BME individuals, sponsored by Kevin J Bolton Ltd., I was able to attend the ARA Annual Conference 2018 held in Glasgow in August. Examined through the lens of the above themes over the course of three days, this year’s conference addressed three keys areas within the sector: representation, diversity and engagement. Following an introduction from Kevin Bolton (@kevjbolton), the conference kicked off with Professor Gus John (@Gus_John) delivering the opening keynote address, entitled “Choices of the Living and the Dead”. With People Make Records the theme for the day, Professor John gave a powerful talk discussing how people are impacting the records and recordkeeping of African (and other) diaspora in the UK, enabling the airbrushing of the history of oppressed communities. Professor John noted yes people make records, but we also determine what to record, and what to do with it once it has been recorded. Noting the ignorance surrounding racial prejudice and violence, citing the Notting Hill race riots, the Windrush generation, and Stephen Lawrence as examples, Professor John illustrated how the commemoration of historical events is selective: while in 2018 the 50th anniversary of the Race Relations Act received much attention, in comparison the 500th anniversary of the start of the Transatlantic Slave Trade was largely ignored, by the sector and the media alike. This culture of oppression, and omission, he said, is leading to ignorance amongst young people about major defining events, contributing to a removal of context to historically oppressed groups. In response to questions from the audience, Professor John noted that one of the problems facing the sector is the failure to interrogate the ‘business as usual’ climate, and that it may be ‘too difficult to consider what an alternative route might be’. Professor John challenged us to question the status quo: ‘Why is my curriculum white? Why isn’t my lecturer black? What does “de-colonising” the curriculum mean? This is what we must ask ourselves’. Following Professor John’s keynote and his ultimate call to action, there was a palpable atmosphere of engagement amongst the delegates, with myself and those around me eager to spend the next three days learning from the experiences of others, listening to new perspectives and extracting guidance on the actions we may take to develop and improve our sector, in terms of representation, diversity and engagement. Various issues relating to these areas were threaded throughout many of the presentations, and as a person of colour at the start of my career in this sector, and recipient of the Diversity Bursary, I was excited to hear more about the challenges facing marginalised communities in archives and records, including some I could relate to on a personal and professional level, and, hopefully, also take away some proposed solutions and recommendations. I attended an excellent talk by Adele Patrick (@AdelePAtrickGWL), of Glasgow Women’s Library, who discussed the place for feminism within the archive, noting GWL’s history in resistance, and insistence on a plural representation, when women’s work, past and present, is eclipsed. Dr Alan Butler (@AButlerArchive), Coordinator at Plymouth LGBT Community Archive, discussed his experiences of trying to create a sense of community within a group that is inherently quite nebulous. Nevertheless, Butler illustrated the importance of capturing LGBTQIA+ history, as people today are increasingly removed from the struggles that previous generations have had to overcome, echoing a similar point Professor Gus John made earlier. A presentation which particularly resonated with me came from Kirsty Fife (@DIYarchivist) and Hannah Henthorn (@hanarchovist), on the issue of diversity in the workforce. 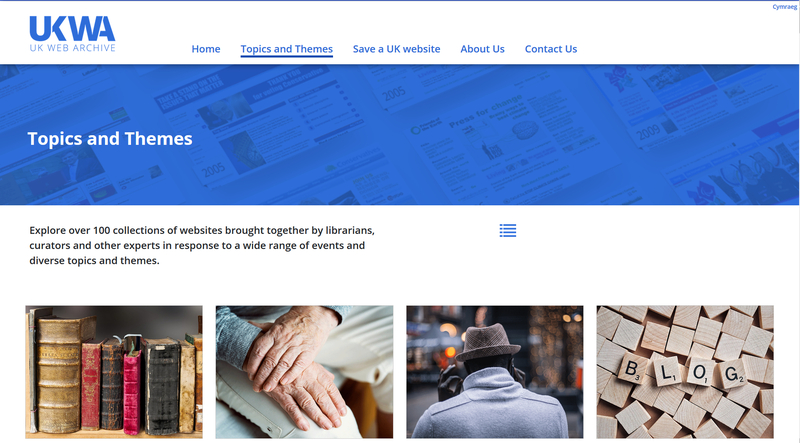 Fife and Henthorn presented the findings from their research, including their survey of experiences of marginalisation in the UK archive sector, highlighting the structural barriers to diversifying the archive sector workforce. Fife and Henthorn identified several key themes which are experienced by marginalised communities in the sector, including: the feeling of isolation and otherness in both workplace and universities; difficulties in gaining qualifications, perhaps due to ill health/disability/financial barriers/other commitments; feeling unsafe and under confident in professional spaces and a frustration at the lack of diversity in leadership roles. As a Graduate Trainee Digital Archivist, I couldn’t abandon my own focus on digital preservation and digital archiving, and as such attended various digital-related talks, including “Machines make records: the future of archival processing” by Jenny Bunn (@JnyBn1), discussing the impact of taking a computational approach to archival processing, “Using digital preservation and access to build a sustainable future for your archive” led by Ann Keen of Preservica, with presentations given by various Preservica users, as well as a mini-workshop led by Sarah Higgins and William Kilbride, on ethics in digital preservation, asking us to consider if we need our own code of conduct in digital preservation, and what this could look like. 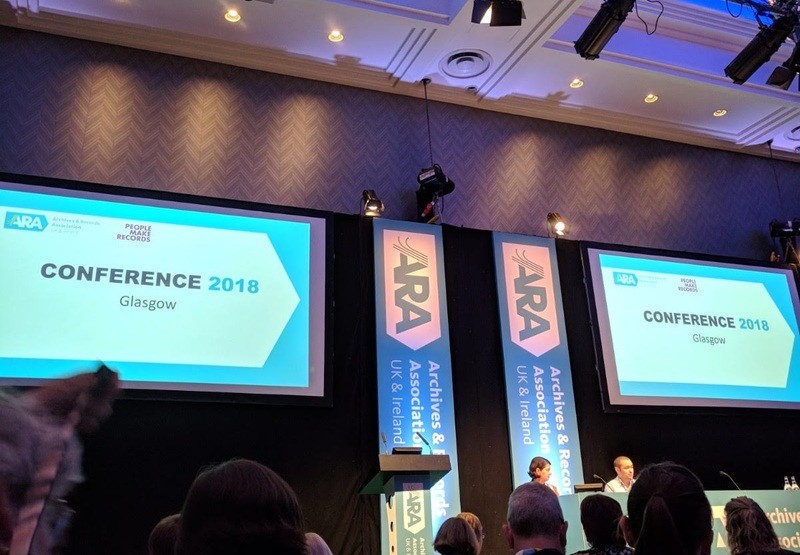 I have only been able to touch on a very small amount of what I heard and learnt at the many and varied talks, presentations and workshops at the ARA conference, however, one thing I took away from the conference was the realisation that archivists and recordkeepers have the power to challenge structural inequalities, and must act now, in order to become truly inclusive. As Michelle Caswell (@professorcaz), 2nd keynote speaker said, we must act with sensitivity, acknowledge our privileges and, above all empower not marginalise. This conference felt like a call to action to the archive and recordkeeping community, in order to include the ‘hard to reach’ communities, or alternatively as Adele Patrick noted, the ‘easy to ignore’. As William Kilbride (@William Kilbride) said, this is an exciting time to be in archives. I want to thank Kevin Bolton for sponsoring the Diversity Bursary, which enabled me to attend an enriching, engaging and informative event, which otherwise would have been inaccessible for me. Keys, David. (2018) Details of horrific first voyages in transatlantic slave trade revealed. 17 August 2018. The Independent. McIntosh, Peggy. (1988) White Privilege: Unpacking the Invisible Knapsack. Essay excerpt from ”White Privilege and Male Privilege: A Personal Account of Coming To See Correspondences through Work in Women’s Studies” Working Paper 189. Greene, M. A. & Meissner, D. (2005) More Product, Less Process: Revamping Traditional Archival Processing. The American Archivist: Fall/Winter 2005, Vol. 68, No. 2, pp. 208-263. Fife, K. & Henthorn, H. (2017) Decentring Qualification: A Radical Examination of Archival Employment Possibilities. Radical Voices Conference, 3 March 2017. Brilmyer, Gracen. (2016) Identifying & Dismantling White Supremacy in Archives. Poster produced in Michelle Caswell’s Archives, Records and Memory class, Fall 2016, UCLA. The online catalogue of the Archive of Dame Louise Johnson is now available. Never one to shy away from a challenge Dame Louise Napier Johnson (1940–2012), biophysicist and structural biologist, spent her long career solving many problems; mostly in the field of structural enzymology that she helped create. 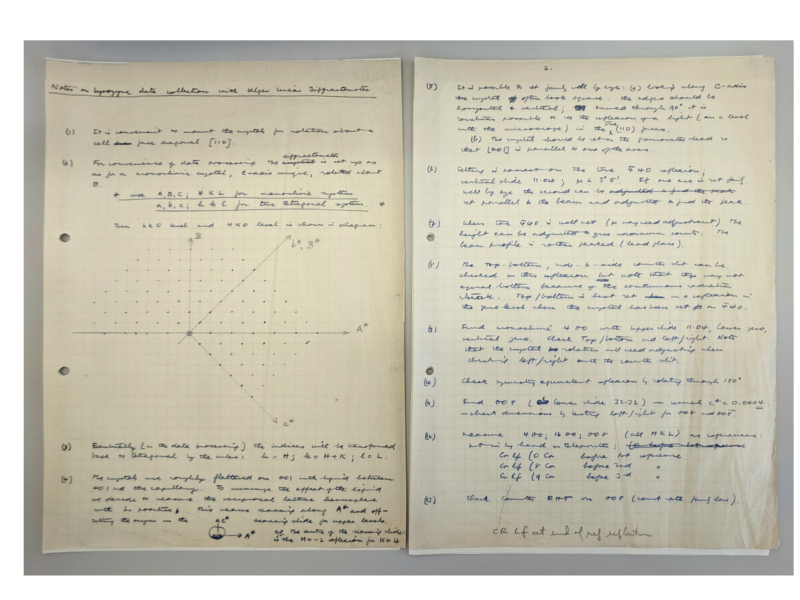 One of the first she solved was when she, David Phillips, and Charles Vernon described the enzyme lysozyme and how it bound its substrates at a special meeting of the Royal Institution in 1965. This was at a time when structural biology was in its infancy and lysozyme was the second protein and first enzyme to have its structure elucidated. It was also the first time that the mechanism through which enzymes worked on a structural level was described. Notes on the structure of lysozyme. This was more than just an interesting theoretical exercise; it had far reaching implications and showed that understanding structure could help in understanding biological processes. Its practical application to drug discovery changed the face of pharmaceutical research. By the 1970s pharmacological researchers were using rational drug design and looking at protein receptors and their properties and binding potential. Knowing the structure of molecules, they could look for potential binding sites and postulate possible interactions. They could then look for analogues or ‘build’ new molecules specific to targeted binding sites. She went on to tackle larger and more complex proteins like ribonuclease S and glycogen phosphorylase, but the tools of the time meant that it was a long hard slog. In order to examine these proteins they had to be crystallised to achieve high resolution images. These crystals did not last long and in the early days of structural biology protein structures were studied using diffractometers that took days to record data sets, often going through several crystals at a time. Needing faster and higher resolution data acquisition she turned to synchrotron radiation, which at the time was used primarily for studying purely physical phenomena. She championed the use of synchrotron radiation in the life sciences and was heavily involved in plans for the construction of a third generation synchrotron, Diamond Light Source, in the UK. Breaking ground for the 250m long x-ray imaging and coherence beamline. She came on board Diamond as the Director of Life Sciences because she believed that good research needed good infrastructure and support. 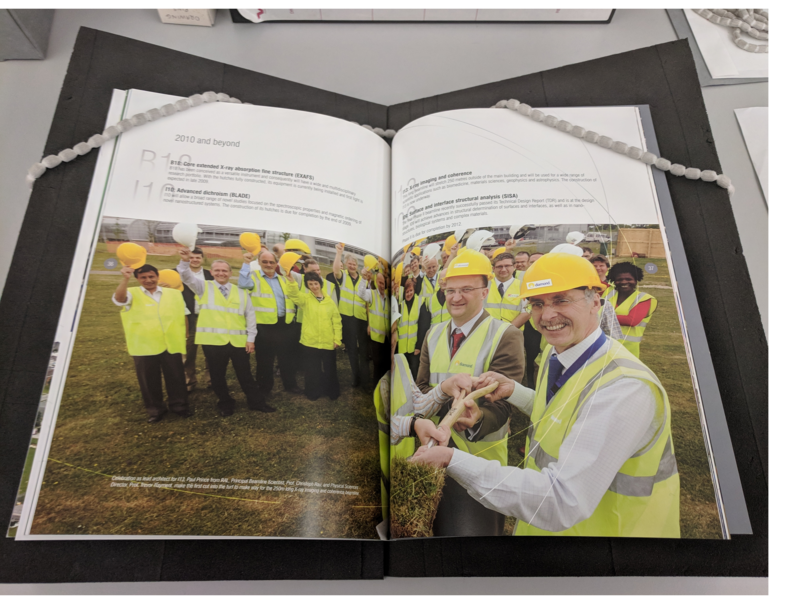 She was heavily involved in planning and testing the beamlines, spearheaded a collaboration with Imperial College London to build the Membrane Protein Laboratory and secured funding for the Harwell Campus for visiting researchers. 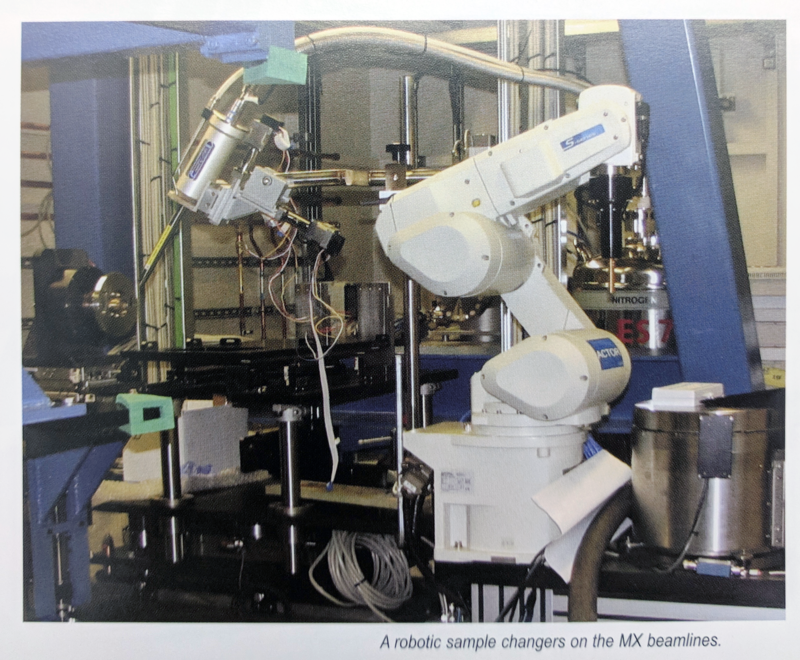 Robotic sample changers on the MX beamlines. Her tireless work saw the number of researchers working in structural biology at Diamond rise to its current 40%. But she didn’t just support researchers with funding and facilities. While Director she continued as head of the Laboratory of Molecular Biophysics where her sympathetic management and light hand brought the best out of her research group. In 1967 Johnson joined David Phillips at the newly founded Laboratory of Molecular Biophysics at Oxford University; succeeding him as department head in 1990. Johnson was a constant in a department which endured considerable turnover of staff. The nature of Johnson’s field was very dynamic and it was common for researchers to move to and from other institutions regularly throughout their careers. One of twenty senior staff in 1975; by 2000 she was the only one remaining. As head, she supervised around 80 people with an outside grant income in 2000 of almost £7 Million; overseeing a successful graduate programme while maintaining a nurturing environment for students and staff alike. She routinely organised over 50 in-house and general research seminars annually. Many of them focused on the laboratory’s very productive output. Between 1995-6 alone, more than 30 protein and virus structures were solved. She trained a generation of Oxford crystallographers; as evidenced by the plethora of Protein Data Bank entries (including many forms of glycogen phosphorylase and cell cycle CDK/cyclin complexes) deposited by her lab; and kept the department running smoothly when they inevitably departed. Johnson endeavoured to be a role model for other women. It was source of pride for Louise Johnson that of the six senior faculty members in her laboratory, three were women. She was also a trustee of the Daphne Jackson fund for scientists returning to research after career breaks. In September 2007 a symposium was held in her honour to recognise her continuing achievements and contribution the University. 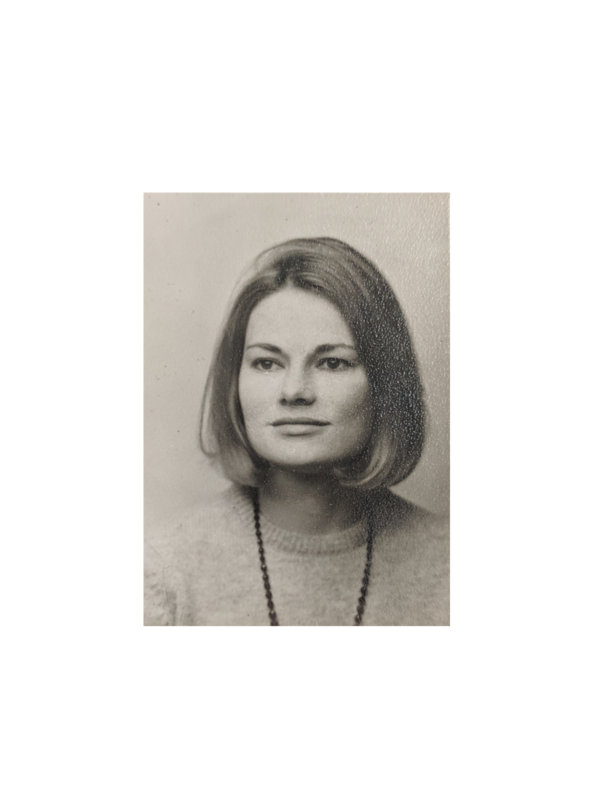 The archive of Louise Johnson came to us through the Saving Oxford Medicine project which sought to discover and catalogue collections relating to Oxford that have had an impact on the medical sciences. These papers were kindly donated by Professor Elspeth Garman and Johnson’s son Umar Salam. The Shāhnāmah – Book of Kings (or King of Books) – is an epic poem written in Persian by Abū l-Qāsim Firdawsī of Ṭūs. Completed in about 1010 CE, the book is composed of some 60,000 verses which narrate the history of Greater Persia from mythical beginnings until the Arab conquests of the 7th century. Said to be the longest poem ever to have been written by a single person, the significance of Firdawsī’s Shāhnāmah to the Persian-speaking world can be compared to that of the works of Homer to Greece. No manuscript copies of the Shāhnāmah survive from the 11th or 12th centuries, and only two from the 13th century are still extant, but many copies from the Timurid and Safavid periods are preserved in Library collections today. Three of the grandsons of Tīmūr (Tamerlane) are known to have had lavish copies of Firdawsī’s Shāhnāmah or Persian Book of Kings made for them. The Shāhnāmahs of Bāysunghur, Muḥammad Jūkī, and Ibrāhīm Sulṭān are preserved in the Golestan Palace, Tehran, the Royal Asiatic Society, London, and the Bodleian Libraries, Oxford, respectively. Left: Shamsah showing inscription dedicated to Ibrāhīm Sulṭān. (MS. Ouseley Add. 176, fol. 12a). Right: Ibrāhīm Sulṭān holding court outdoors. (MS. Ouseley Add. 176, fol. 1b). Thought to have been made in Shiraz sometime between 1430 and Ibrāhīm Sulṭān’s death in 1435, this copy of the Shāhnāmah is known for its exceptional miniature paintings and exquisite illuminated panels. The manuscript was acquired by Sir Gore Ouseley, a Diplomat and Linguist, during travels in the East in the early 19th century, and came into the Bodleian in the 1850s along with many other of Sir Gore’s collections. It is now preserved as MS. Ouseley Add. 176. Ibrāhīm Sulṭān’s Shāhnāmah is now digitally available online via Digital.Bodleian. 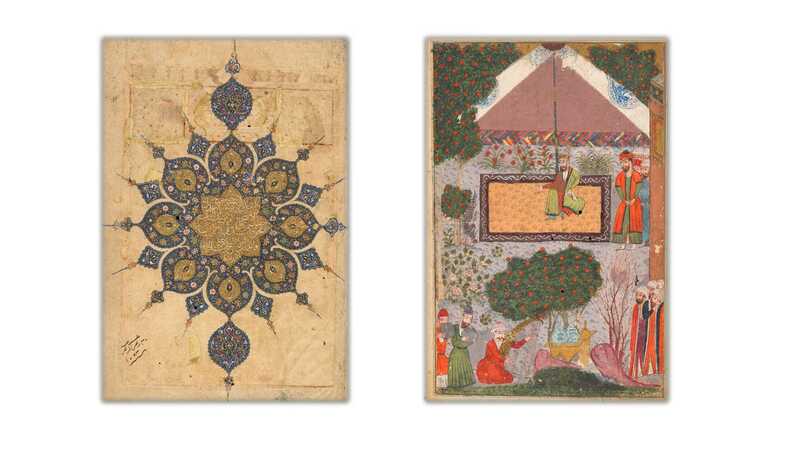 Recently, its sibling Muḥammad Jūkī’s Shāhnāmah was published online by the Royal Asiatic Society; both in good time for Nawruz or Persian New Year on 20th March! Abdullaeva, F., & Melville, C., The Persian book of kings : Ibrahim Sultan’s Shahnama (Treasures from the Bodleian Library). Oxford: Bodleian Library, 2008. Beeston, A. F. L., Hermann Ethé, and Eduard Sachau. Catalogue of the Persian, Turkish, Hindûstânî, and Pushtû Manuscripts in the Bodleian Library . Oxford: At the Clarendon, 1889. Robinson, B. W., A Descriptive Catalogue of the Persian Paintings in the Bodleian Library. Oxford: Clarendon, 1958. The Bodleian Libraries would like to thank the Bahari Fund for helping to make this digitization project possible. In July last year my colleague Miten and I attended a DPC Briefing Day titled Email Preservation: How Hard Can It Be? which introduced me to the work of the Task Force on Technical Approaches to Email Archives and we were lucky enough to attend the second session last week. Arranging a second session gave Chris Prom (@chrisprom), University of Illinois at Urbana-Champaign and Kate Murray (@fileformatology), Library of Congress, co-chair’s of the Task Force the opportunity to reflect upon and add the issues raised from the first session to the Task Force Report, and provided the event attendees with an update on their progress overall, in anticipation of their final report scheduled to be published some time in April. The first guest presentation was given by Dr. James Baker (@j_w_baker), University of Sussex, who was inspired to write about the use of email archives within research by two key texts; Born-digital archives at the Wellcome Library: appraisal and sensitivity review of two hard drives (2016), an article by Victoria Sloyan, and Dust (2001) a book by Carolyn Steedman. These texts led Dr. Baker to think of the “imagination of the archive” as he put it, the mystique of archival research, stemming from the imagery of 19th century research processes. He expanded on this idea, stating “physically and ontologically unique; the manuscript, is no longer what we imagine to be an archive”. However, despite this new platform for research, Dr. Baker stated that very few people outside of archive professionals know that born-digital archives exist, yet alone use them. This is an issue, as archives require evidence of use, therefore, we need to encourage use. D) the physical media; asking does the media hold value? 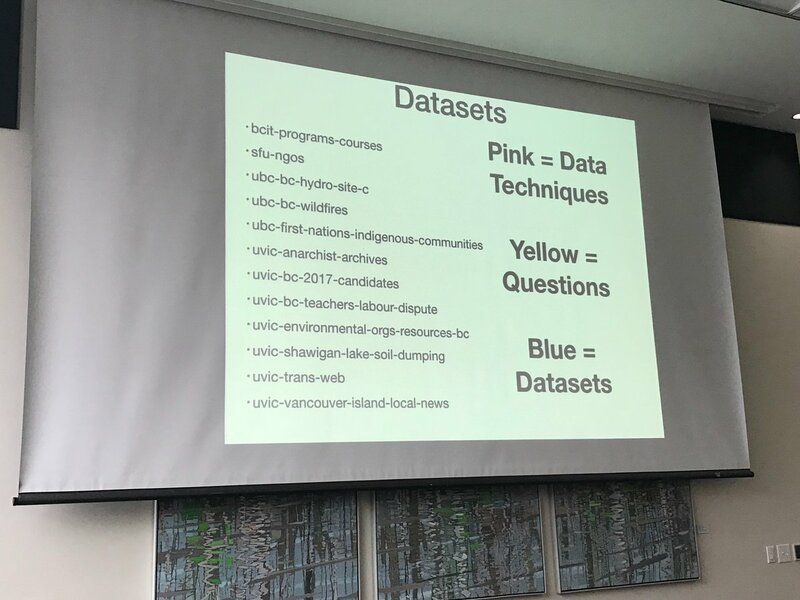 Levels of description; filenames are important, and are valuable data in themselves to researchers. Users need a balance between curation and an authentic representation of the original order. “Bog-standard” laptop as access point; using modern technology that is already used by many researchers as the mode of access to email and digital archives creates a sense of familiarity when engaging with the content. Getting the researcher from desk to archive; there is a substantial amount of work needed to make the researcher aware of the resources available to them and how – can they remote access, how much collection level description is necessary? Dr. Baker concluded that even with outreach and awareness events such as the one we were all attending, born-digital archives are not yet accessible to researchers, and this has made me realise the digital preservation community must push for access solutions, and get these out to users, to enable researchers to gain the insights they might from our digital collections. The third presentation of the day was given by James Lappin (@JamesLappin), Loughborough University, who discussed the issues involved in applying archival policies to emails in a governmental context. His main point concerned the routine deletion of email that happens in governments around the world. He said there are no civil servants email accounts scheduled to be saved past the next 3 – 4 years – but, they may be available via a different structure; a kind of records management system. However, Lappin pointed out the crux in this scenario: government departments have no budget to move and save many individuals email accounts, and no real idea of the numerics: how much to save, how much can be saved? Lappin suggested an alternative: keep the emails of the senior staff only, however, this begs the questions, how do we filter out sensitive and personal content? Lappin posits that auto-deletion is the solution, aiming to spare institutions from unmanageable volumes of email and the consequential breach of data protection. But how do we transfer emails to a EDRMS, what structures do we use, how do we separate individuals, how do we enforce the transfer of emails? These issues are to be worked out, and can be, Lappin argues, if we implement auto-deletion as tool to make email preservation less daunting , as at the end of the day, the current goal is to retain the “important” emails, which will make both government departments and historians happy, and in turn, this makes archivists happy. This does indeed seem like a positive scenario for us all! However, it was particularly interesting when Lappin made his next point: what if the very nature of email, as intimate and immediate, makes governments uncomfortable with the idea of saving and preserving governmental correspondence? Therefore, governments must be more active in their selection processes, and save something, rather than nothing – which is where the implementation of auto-deletion, could, again, prove useful! I, personally, feel this fair and thorough, but only time will tell what route various governments take. On a side note: Lappin runs an excellent comic-based blog on Records Management which you can see here. One of the key issues that stood out for me today was, maybe surprisingly, not to do with the technology used in email preservation, but how to address the myriad issues email preservation brings to light, namely the feasibility of data protection, sensitivity review and appraisal, particularly prevalent when dealing in such vast quantities of material. Email can only be preserved once we have defined what constitutes ’email’ and how to proceed ethically, morally and legally. Then, we can move forward with the implementation of the technical frameworks, which have been designed to meet our pre-defined requirements, that will enable access to historically valuable, and information rich, email archives, that will yield much in the name of research. As an Ancient History graduate, significance and authenticity of source information characterised my university education. Transferring these principles to digital objects in an archival situation is a challenge I look forward to learning more about and embracing. Therefore I set off to Tate Britain on a cold Friday morning excited to explore the Digital Preservation Coalition’s briefing: Significance & Authenticity. Here are some of my reflections. Authenticity clearly carries with it evidential value; if something is not what it purports to be then how can it (claim to) be authentic? Further measures such as increasing metadata fields – does this ensure authenticity? For an archival record to retain authenticity there must be record of the original creation or experience of the digital object; otherwise we are looking at data without context. This also has a bearing on how significant an archival record is. A suggestion was also made that perhaps as a sector too much over-emphasis is placed on integrity checking procedures. Questions surfaced such as: is the digital preservation community too reliant on it? And in turn, is this practical process approach to ensuring authenticity too simplistic? 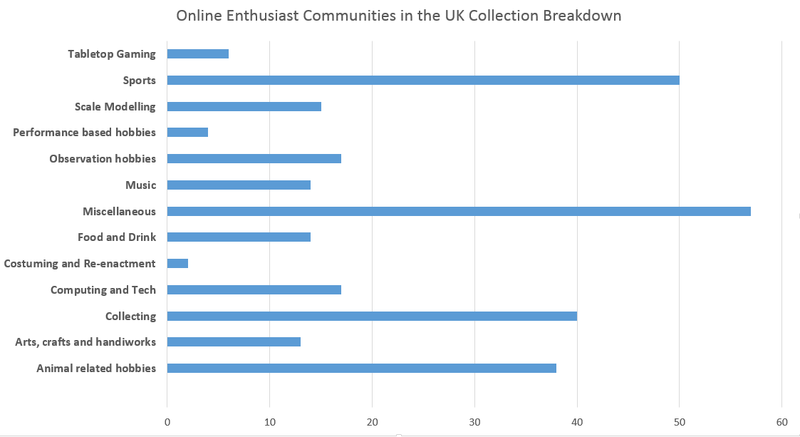 Should the users and re-users (the designated community) be considered more extensively when deciding the significance of a digital object? Emulation as a digital preservation action prioritises the experience of using the data: is this the way to go regarding maintaining both the significant properties together with the authenticity? There was no doubt left in my mind that the two principles are inextricably linked. However, not only are they increasingly subjective for both the record keeper and the end user, they must be distinguished from one another. For example, if a digital object can be interpreted as both a game and a book, yet the object was created and marketed as a book, does this make it any less significant or authentic? Or is the dispute part of what makes the object significant; the creation, characterisation and presentation of data in digital form is reflective of society today and what researchers may (or may not be) interested in in the future? We do not know and, as a fellow delegate reminded, cannot prejudice future research needs. Building on the open mindedness that the discussion encouraged, we were then fortunate enough to hear and learn from practitioners of differing backgrounds regarding how they ensure significance and authenticity of their collections. One particular example had me contemplating all weekend. Patricia and Tom explained that they work with time-based media art and its creators. Working (mostly) with living artists ensures a short chain of provenance, however the nature of the digital art means that applying authenticity and significance is in no way straightforward. A principle which immediately affects the criteria of significance is the fact that it is very important that the Tate can exhibit the works, illustrating that differences in organisations will of course have a bearing on how significant a record is. 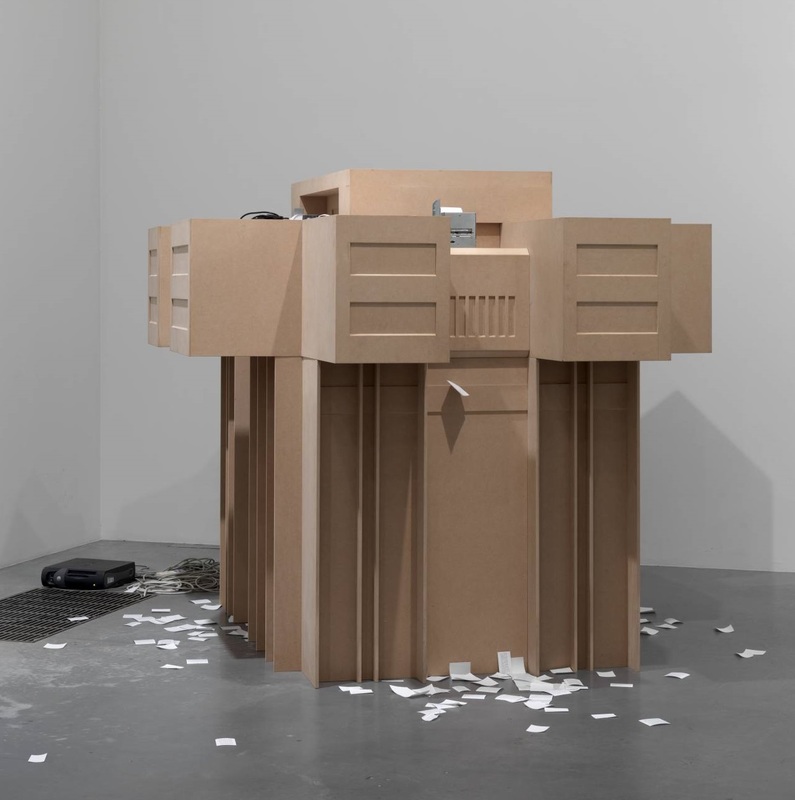 The artwork comprises of a range of components: high speed printers, paper rolls, a web search program and accompanying hardware, movement sensors and a model replica of the Peruvian government building ‘El Petagonito’ which is a symbol of brutalist architecture. The computer is programmed to search the web for references to ‘Brutalism’ and the different extracts of information it gathers are printed from mounted printers on the sculpture, left to fall to the floor around the replica. Tom explained that retaining authenticity of the digital art was very much a case of the commitment to represent the artists work together with the arrangement and intention. One method of ensuring this is the transfer of a document from the creator called ‘Installation Parameters’. For this particular example, it contained details such as paper type and cabling needs. It also contained display specifications such as the hardware being a very visible element of the art work. Further documentation is created and stored to preserve the original authenticity and thus unique significance of the artwork and the integrity of its ‘performance’. Provenance information such as diagrams, process metadata and the original source code is stored separately to the work itself. However, Tom acknowledged there is no doubt the work will need to change and in turn will be reinterpreted. Interestingly, the point was made that the text itself on the paper itself is time sensitive; live search results related to Brutalism will evolve and change. Looking ahead, what will happen when the hardware fails? And even, what will happen when nobody uses printers anymore? Stockpiling is only a short term plan for maintaining authenticity and significance. Furthermore, even if hardware can be guaranteed then the program software itself generates different issues. Software emulation, code-change tracking systems and a binary analysis are all to be explored as a means to enable authenticity but there will always be a risk and need for alternative solutions. Would these changes reduce the authenticity or significance? I believe authenticity is associated with intention and so perhaps if changes are communicated to the user with justifications this could be one way of maintaining this principle. Significance, on the other hand, is more tricky. Without the significant and notable properties of the work, is significance automatically lost? This case study reinforced that there is much to explore and consider when approaching the principles of authenticity and significance of digital objects. To conclude, Tom and Patricia reinforced that within the artistic context, decisions around authenticity and significance are made through collaborative dialogues with the artist/creator which does indeed provide direction. After 3 more talks and a panel session the briefing ended with a workshop requiring us to evaluate the significance and authenticity of a digital object provided. As a trainee digital archivist I can be guilty of shying away from group discussions/exercises within the community of practice, so I was really pleased to jump in and contribute during the group workshop exercise. Thank you to the DPC and all involved for a brilliant day. PASIG 2017 (Preservation and Archiving Special Interest Group) was hosted in Oxford this year at the Natural History Museum by Bodleian Libraries & Digital Preservation at Oxford and Cambridge (DPOC). I attended on all three days (11th -13th September), when I wasn’t working I had the opportunity to listen to some thought provoking talks centered around the issue of digital preservation. One of the highlights of the conference for me, was a talk given by Natasa Milic-Frayling, the founder of Intact Digital. The presentation entitled ‘Ageing of Digital: Towards Managed Services for Digital Continuity’ demonstrated the innovative ways in which digital preservation issues are being approached. Digital technology has a short lifespan; hardware and software become redundant and obsolete in a very short time, essentially outdated. This is known as ‘Legacy Software’, outdated software that no longer receives vendor support or updates. This poses the problem – How can we manage the life-cycle of digital in the face of a dynamic and changing computing ecosystem? Technologies are routinely changed, updated (sometimes at a cost), made redundant and retired. The value of digital assets needs to be protected. In the current climate there is an imbalance of power between the technology producers and providers and the content producers, owners and curators. The providers and producers can move on without the opinion or input of those who use the software. How do we enable prolonged use of software to protect value of digital assets? A case study was presented that contextualised the problem and the solution. The vendor Tamal vista Insights provided Cut&Search, a software for automated and semi automated indexing of digitised manuscripts and digital artefacts that standard OCR can not handle. The software was supplied to Fo Guang Shan, an International Chinese Buddhist Monastic Order with over 200 branch temples worldwide for use with their digitised manuscript collection. This project is made up of thousands of volunteers and spans years, beyond the providers expected life-cycle for their product, its primary market life-time. The software can be hosted in a virtual machine and accessed remotely via a browser. The implications of this are far reaching for projects like the ones undertaken by the Fo Guang Shan. They don’t need to worry about the Cut&Search software becoming redundant and their digital assets remain protected. For smaller organisations operating on ever decreasing budgets this is an important step both for asset protection and digital preservation. Although this is an important step, there is still much work to do and some key areas that need to be developed were highlighted. This will result in a sustained use of digital. 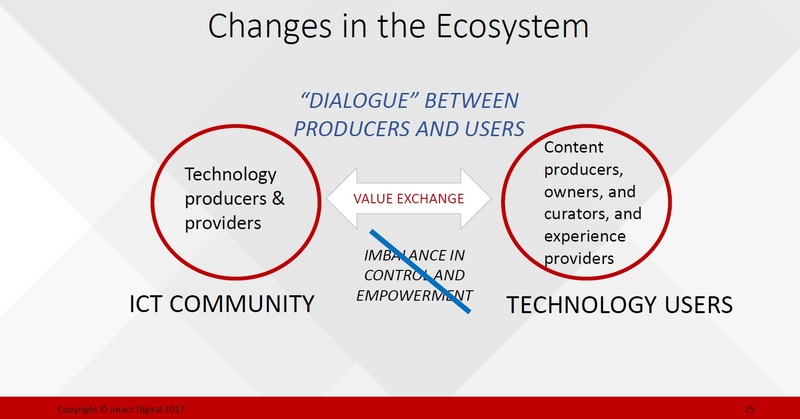 In taking these steps and creating a dialogue between the technology producers/providers and the content producers it changes the dynamic of the ecosystem, readdressing the imbalance in control. 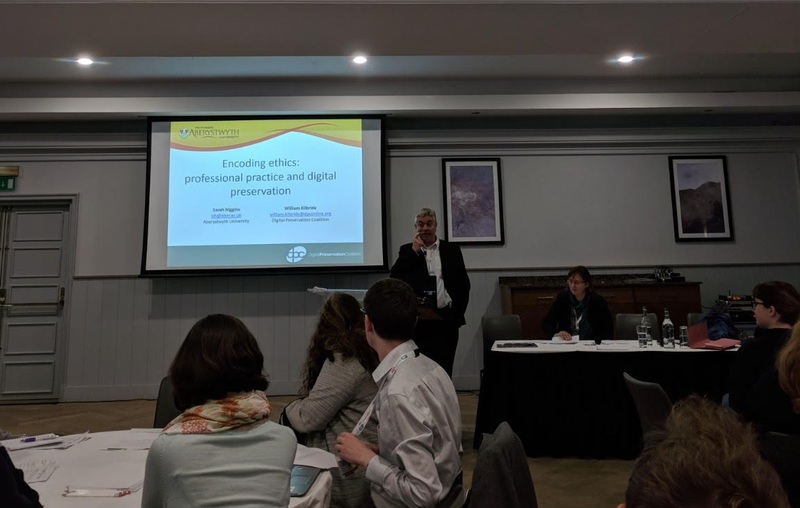 As a trainee I still have lots to learn but a major theme running throughout digital archiving and digital preservation is the need for communication, collaboration and dialogue. Working together, sharing ideas and the challenges is key to securing the future of digital content. 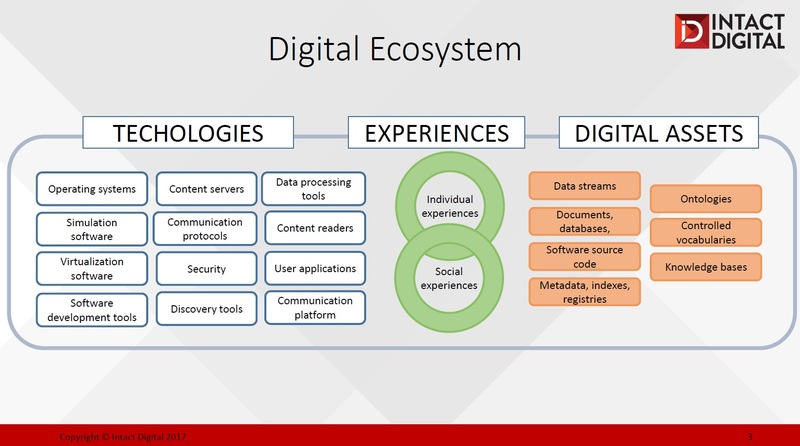 A complete collection of the slides relating to this topic can be found here; https://doi.org/10.6084/m9.figshare.5415040.v1 Milic-Frayling, Natasa (2017): Aging of digital: Towards managed services for digital continuity. figshare.